Keep track of Bass Jam events, tickets and news - all in one place. Join this group now for updates as they happen! 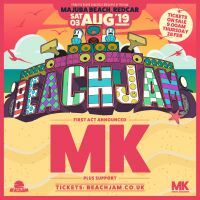 BeachJam are pleased to announce that internationally renowned DJ & chart-topping producer; MK is set to headline their debut event at Redcar?s stunning Majuba Beach on Saturday 3rd August. Further act announcements have yet to be announced for the debut BeachJam event, brought to you by the board breakers & shakers of PierJam, some of the biggest day time summer parties in the North West of England, which will be launching this summer at the North East&apos;s stunning Majuba Beach and will bring some of the biggest acts of the House & Bass scene to the North East shore across 2 stages of music with support from some of the biggest local house music brands. The day time boutique festival will also feature a host of festival attractions including a fun fair, an array of festival stalls and top food traders from the region. PierJam by Night - Part One After Party Announced! Over 82% of Tickets Now Sold for the Bass Music Awards This Sunday!